Above: On a cool evening, a fisherman tries his luck along the vacant beach of Clear Lake State Park. 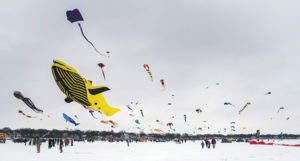 A kite festival in February draws crowds to the frozen lake. Photographer: Ron Maggard. Formed when the glaciers beat their retreat tens of thousands of years ago, Clear Lake—nearly five times as long as it is wide—has served as a magnet for those within its orbit for hundreds of years. Long before white settlers crossed the Mississippi en masse, it was the Sioux and Winnebago tribes who found respite on the lake’s shores. People—residents, visitors, those near, those far—have always found ways to get to the lake, especially in summertime. But for many, Clear Lake has special appeal in the sparkling days of autumn, when the bugs, tourists and humidity have relented, locals are caught up in school activities, cafes have tables free and some shops have end-of-season sales. The Tiki Bar at PM Park appeals to more fair-weather friends. And in a community that prides itself on the attraction of local events, Clear Lake has several annual events that are conspicuously “off season.” Antiques in the Square is a big draw in early September (Sept. 2 this year) with more than 60 dealers gathered in the city park. And the Harvest Festival in October (Oct. 6 this year) mixes wine sampling, trolley rides, a huge farmers market and entertaining games. In fact, one of the area’s most colorful events takes place on the lake in February: Color the Wind (Feb. 16, 2019) is the Midwest’s largest winter kite festival, featuring huge inflatable kites flown by hobbyists from across the United States. 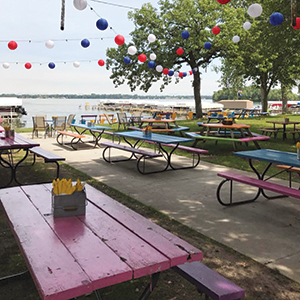 The active four-season character is a source of pride for locals and a lure for others who may live elsewhere but have established firm roots in Clear Lake. 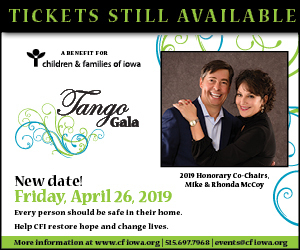 That’s the case for Michael and Lynne Belknap; the couple and their two children live in Des Moines but travel almost every weekend to their home in Clear Lake. 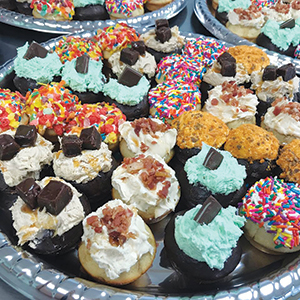 Treats from South Shore Donut are delightful year-round. It’s a family tradition for Mike; his parents bought a place on the water when he was 14 and it was a spot, away from distractions, where everyone gathered. Eventually Mike and Lynne bought a place with one of his brothers, about a block from the water and in an old Christian camp called Belle Harbor. After a decade, when the spot next door became available—“really a shack of barn boards, up on cinderblocks” says Lynne—the couple bought it. Today, nearly every weekend you’ll find the family of four (sometimes with a friend or two in tow) in Clear Lake—waking up to coffee and breakfast, much as their grandparents did. When they aren’t enjoying quiet time at home, the Belknaps have some favorite pastimes around the lake that they recommend to visitors. Saturday routine: The Belknaps love to bike around the lake, which may include breakfast at PM Park or grabbing a sweet treat at South Shore Donut Co. (southshoredonutco.com). Bonus, says Lynne: Come nighttime, you can boat up to the Tiki Bar at PM Park for a drink. Fairs and holidays, always: Fairs and festivals are scattered throughout the Chamber of Commerce calendar, but probably the busiest time of the year is the Fourth of July. “It’s amazing what the town puts on—there are carnival rides for every age, a huge parade, and unbelievable fireworks,” she says. Property owners earn cash by opening their doors to Des Moines visitors.